Today while I was near a small bus stop in Wuzhou, a mini-mini Jumbo Wuzhou Bus stopped to drop off and pick up passengers. I didn't know where the bus was headed. 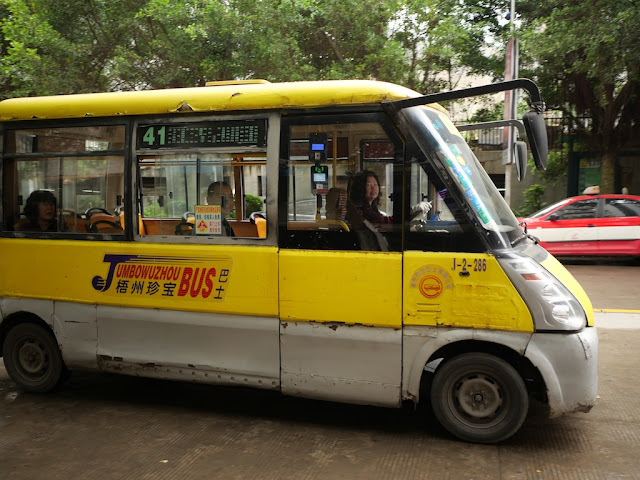 But I also had never ridden a mini-mini Jumbo Wuzhou Bus before, and this might be my last opportunity. I carefully weighed my options for a second or two. As typical for the smaller buses, the ride cost 1 yuan (about U.S. 15 cents). At the beginning I found it difficult to keep track of my location since I didn't have a clear view while I stood in the packed bus. Later when it was less crowded I had a seat in the back. The ride was mostly uneventful. Some people chatted in Cantonese. Some people looked out the windows. Some people checked their mobile phones. There were no accidents. So despite previously saying the Jumbo Wuzhou Bus theme was finished, here's another post about them. I suspect some readers might not be thrilled about another bus post yet are now thinking, "Wait, I want to know about the 'kicked off' part mentioned in the title." OK, it isn't as dramatic as it sounds. While I was busy looking at a few photos I had taken, the bus stopped. This was not unusual. Buses are supposed to do this from time to time. Then many people got off the bus. This was not so unusual either. Then I noticed that the bus driver was turned around and looking at me. The bus driver said we were at the last stop. Normally this wouldn't confuse me, but I saw two other passengers still sitting on the bus. Some bus routes in Wuzhou make a circle or loop. So I guessed that this last stop was really just part of a journey that could take me to other locations. Maybe one of them would strike me as particularly interesting and serve to further justify spending an extra yuan today. So after looking at the other passengers to confirm their existence, I said I would stay on as well. The bus driver then explained that I was welcome to take the bus again, but I would need to re-board at the stop across the street. Indeed, there was a stop across the street. But what about the other two people? Why weren't they getting off? Was I missing an adventure? Trying to help, one of the passengers asked me where I wanted to go. This was one of those situations where I suspected an honest answer was only going to confuse matters more. So I refrained from saying, "I don't know." Trying to sort things out, I then returned the favor and asked where he was going on this bus that had supposedly already reached its last stop. But the bus driver interrupted his reply and repeated that we were at the last stop. She looked like she really wanted this all to end. I looked at the passenger who hadn't said anything at all. She looked like she really wanted to have nothing to do with any of this. I now felt like I had brought enough disharmony to this tiny bus and its inhabitants, so I got off. And then of course I photographed the bus. After the bus drove away from its last stop with two passengers still on board, I looked at the bus stop sign wondering where I was. The sign immediately cleared up several issues. One, this stop was not only the last for the bus I had just ridden but for several other routes as well. Two, not only did I now know my location, but I was quite familiar with it. About 10-20 meters away was the Jumbo Wuzhou Bus parking area with art above it. And finally, three, I now had a possible answer to why the two passengers stayed on board. Possibly the parking lot was a little bit closer to wherever they were going. Confident that the bus I had just ridden would be at the parking lot, I walked over to take another photo to better record whether it was as rusty as others I had seen. As I took a couple of photos, a woman came out of a small office and appeared quite concerned. She asked me why I was photographing the bus. Once more, I wasn't sure the first answer that came to mind was going to help matters. 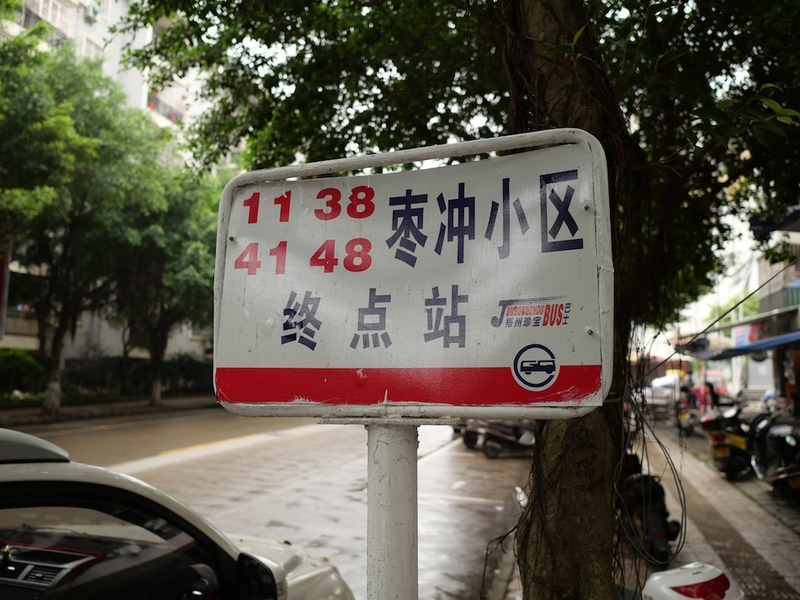 So I said something else that was true, "I like Jumbo Wuzhou Buses!" On later reflection, I believe I said the first half of my answer in Chinese and the second half mostly in English. Whatever the case, I doubt the woman felt like my answer had clarified much for her. There's some rust for sure, but it doesn't look like anything is going to fall off today. I knew there was another bus which departed from there which stopped at the place that had been my intended destination before taking yet another random bus ride. But I wondered if I had attracted a bit too much attention at the parking area. 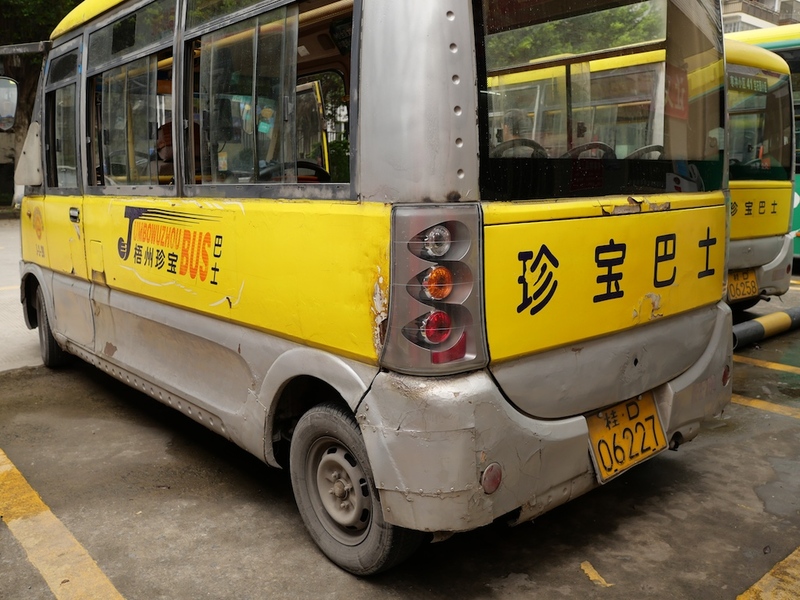 So I walked away . . .
. . . pleased that I had finally ridden a mini-mini Jumbo Wuzhou Bus. Thanks, those were special moments.